Jinx has wrapped herself in a coat of guilt and shame since her mother's passing. Though she was only a teenager when it happened, Jinx has shouldered the blame for what took place in their house years ago. The heavy burden on her heart has caused her to push her husband and young son away. Believing that she deserves nothing, she lives in a world of solitude among the dead. And then Lemon appears on her doorstep. Initially, it's unclear why Lemon is there and that causes the story to drag just a little. He offers no explanation, yet Jinx still welcomes him in. As the story progresses, it becomes apparent that he's there to ease her load and, at the same time, unburden himself. Knowing that she has blamed herself for that tragic night, he's come to absolve her. The adult Lemon was around to witness the deterioration of the relationship between Jinx and her mother. Their once close relationship is fractured when Joy begins to date Berris. As Berris' closest friend, Lemon is well aware of his friend's insecurities, but that doesn't stop him from baiting him occasionally. In fact, rather than calling them friends, I'd say they were frenemies. Berris' badmouthing has gotten him banned from Lemon's house and Lemon covets Berris' most prized possession, Joy. Jealousy rears its ugly head repeatedly as Jinx begins to feel pushed aside by her mother in favor of Berris. Berris' jealousy knows no bounds and he delivers brutal blows to say with his fists what he can't say with words. Lemon's jealousy sets in motion a chain of events that ultimately lead to the demise of the woman all three love. As I stated before, this book started off slow with a tendency to drag. I was tempted to put it down, but it picked up dramatically after a few chapters. Once it got good, I was so drawn in that I stayed up late, and would have continued reading until I finished if I hadn't had to work the next day. It was all I could do to make it to lunch so I could find out what happened next. Edwards' style is reminiscent of Zadie Smith, a beloved author by most, but one I've never been able to really get into. However, I thoroughly enjoyed A Cupboard Full of Coats. Now let's talk about the cover. 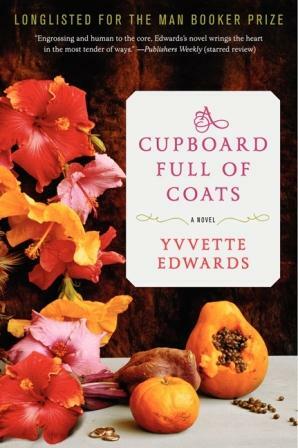 In the book, whenever Joy and Berris fight, he always buys her a gorgeous coat, hence, she ends up with a cupboard full of coats. So, in my opinion, a cover showing said coats would have been gorgeous, but I can live with the current cover. The characters are originally from, or descendants of, Montserrat, a Caribbean island. Many of the scenes are centered around food, the cooking and eating of it. So to me, the cover shows the ingredients needed to make sorrel, a Caribbean drink, which Lemon does. @reads4pleasure I feel like stories about people of color internationally always have fruit and flowers on the cover. Not everyone agrees, but I'll let you read the book and form your own opinion. In the meantime, what are your thoughts on Caribbean lit covers? Have you noticed an overabundance of fruit and flowers where their covers are concerned? Disclaimer: Copy of book received from publisher as part of TLC Book Tours, opinions are my own.